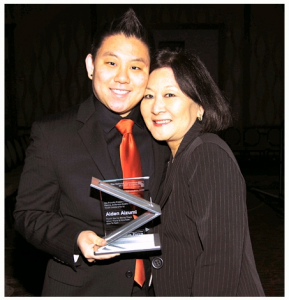 Marsha and Aiden Aizumi, the authors of “Two Spirits, One Heart: A Mother, Her Transgendered Son, and Their Journey to Love and Aceptance” will speak on Saturday, March 16, at 2 p.m. at the Japanese American National Museum, 100 N. Central Ave. in Little Tokyo. In the book, Marsha Aizumi shares her compelling story of parenting a young woman who came out as a lesbian, then transitioned to male. This inspiring memoir chronicles her personal journey from fear, uncertainty, and sadness to unconditional love, acceptance, and support of her son, Aiden, who struggled to reconcile his gender identity. Marsha Aizumi is a Sansei mother of two children, and has been married for over 40 years. She is an educational consultant, LGBT advocate, and author, and serves on the Parents, Families, and Friends for Lesbians and Gays (PFLAG) National Board of Directors. She has shared her story across the nation, most recently at the 2012 Creating Change Conference in Baltimore, Emerson College in Boston, USC, UCLA, and Antioch University in Los Angeles, Universalist Unitarian Church in Long Beach, and the National Queer Asian Pacific Islander Alliance/PFLAG event in New York City. For more information on her upcoming speaking engagements, visit www.marshaaizumi.com. Aiden Aizumi serves on the Trevor Project National Youth Advisory Council and the Executive Board of Pasadena PFLAG, is a LifeWorks mentee, and has volunteered to speak at high schools and colleges to broaden the awareness of LGBT issues. In 2010, he was honored with the Paul A. Anderson Youth Leader Award from the National Gay and Lesbian Task Force in Dallas. He works with his mother to bring high school diploma programs to LGBT youth who are dropping out or have dropped out of high school due to harassment and bullying. He hopes to share his journey with others and bring hope and empowerment to youth who need support. He believes his story of success can be theirs as well.